The term schnorrer is generally regarded as derogatory (and has expanded to refer to anyone who is not quite making it, socially, financially or appearance-wise) and has generated a full genre of Jewish legends, stories and jokes. But all humor aside, Jewish communities have historically done the honorable work of accommodating and supporting schnorrers with dignity. Many contemporary Jewish communities have a special board to whom traveling collectors can present their bona fides (medical bills, letters from local rabbis etc.) in exchange for a letter of recommendation (known as a hamlatzah). With these letters in hand, they go from door to door (identifying Jewish homes by the mezuzah scroll on the right side of the doorway) and canvass synagogues to collect donations large and small. Communities may also make accommodations available so that the collectors can minimize the expenses accrued during their travels. In times gone by, many communities supported a hekdesh (Hebrew for “sacred [place]”), where wayfarers and other indigents could find lodgings. Since these places were often somewhat neglected, this term has also come to refer to a messy place, along the lines of a chazer shtahl (Yiddish for “pigsty”). The Meshuloch: Literally “agent,” a meshuloch (pl. 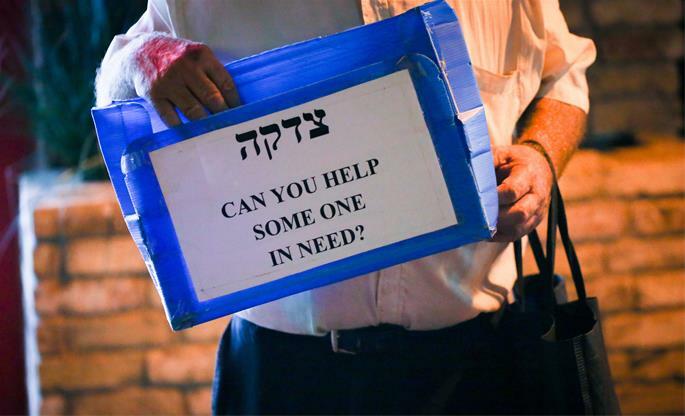 meshulochim) refers to one who is collecting funds for a cause other than himself and his immediate family. These typically include social service organizations or institutions of Torah scholarship. Since the Middle Ages, there has been a stream of meshulochim traveling from the Holy Land to the diaspora to give Jews the merit of supporting those who make their homes on the sacred soil of Israel. A meshuloch from the Land of Israel was often known as a shadar, an acronym for sheliach derabanan (“agent of the rabbis”), presumably since the rabbis of the Holy Land would often choose an outstanding scholar to represent their cause to communities abroad. In Chabad parlance, the term was also given to select chassidim whose responsibilities included raising funds for the Rebbe’s institutions. Tzedakah: Despite the negative connotations attached to the term schnorrer, the collector himself may feel little shame in what he is doing. On the contrary, he may feel that he is doing his fellow Jews a favor by allowing them to contribute to the worthy cause(s) he represents. This ties in directly to the word tzedakah, which is often translated as “charity” but actually means “justice.” For a Jew to give money to another is not an act of generosity or largess. Rather, it is an honest reflection of the way of the world: As everything belongs to G‑d, and He gives one person more than another so that they may perfect His world by redistributing the wealth accordingly, tzedakah is better translated as righteousness, or a means of setting the world right. There was once a fellow who would regularly collect alms from a Jewish magnate (known in Yiddish as a gvir), claiming that the money was for his impoverished mother. What (and Who) Is Rabbi Meir Baal Haness? Why Does G-d Not Feed the Poor? What If a Charity Turns Out to Be Fake? Is it appropriate to give charity at night? I'm uncomfortable with the constant calling for donations from the many and varied sites claiming Jewish connections. Sometime ago a homeless man asked for money. I do not give money instead I give food or information on how to become independent. A year goes by, here he is asking for money again. I asked him if he followed my advice at all, his reply "I have been too busy". Since when does it take more than a year to start to help oneself. I refused to give him anything from that point forward. Point is, we should help those, even seek out those whom wish for better stars. I can not allow those without sensible willingness to be a burden on my community so therefor I refuse to give them means to continue their hapless behaviour. Am I wrong? Do we need to give skidrow bums dollars to become skidrow(ier)? Are they not performing treachery within our communities?